The SOCOTEC Group continues its expansion with four acquisitions: AJA Registrars Group, based in Asia, ITM in the UK, PSP in Germany and Axe QSE in Morocco. The SOCOTEC Group acquired AJA Registrars Group, a specialist in management system certification with six subsidiaries in Singapore, Thailand, the Philippines, Hong Kong, the UK and the USA. 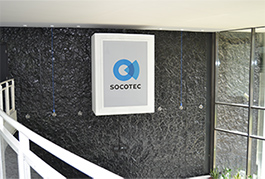 SOCOTEC UK acquired ITM Monitoring, specialists in instrumentation for monitoring civil engineering structures and detecting any effects on infrastructure caused by natural phenomena or nearby works. ZPP in Germany acquired PSP Tunnelling GmbH, a company of consulting engineers for road and rail tunnels, tunnel boring machines and foundations. SOCOTEC Morocco acquired Casablanca-based Axe QSE, with services in environmental regulatory intelligence, environmental impact studies, air and water quality measurements, and management system support. These four acquisitions, representing full-year cumulative revenue of €13 million, contribute to the Group’s ambition to become the European leader in TIC1 by 2020 in the construction and infrastructure sectors.